Wristwatches reportedly spread all over the world as military gear during the First World War. While Europe and the United States initially led global production, Japanese manufacturers improved their technology and started competing in the global market after the Second World War. Made-in-Japan quartz watches became known for being affordable yet accurate. 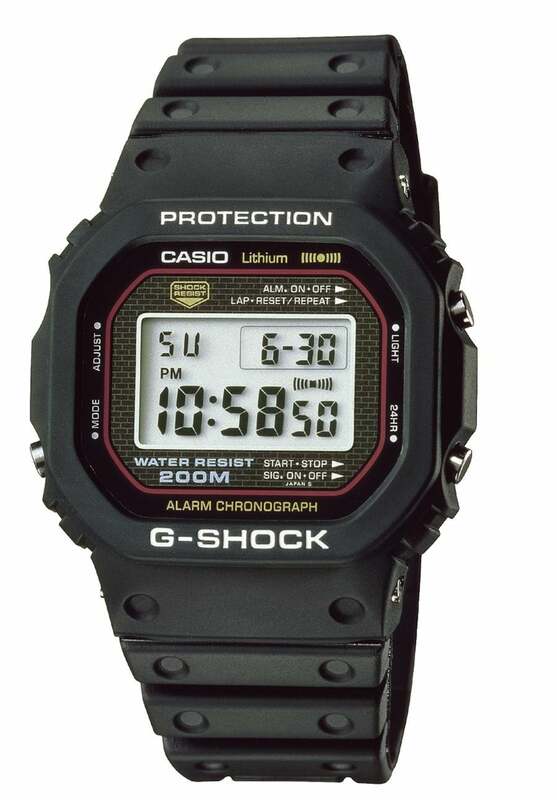 CASIO COMPUTER CO., LTD. took this even further by pursuing the goal of making their products shock-resistant and creating a whole new market with their trademark G-SHOCK watches. Ibe’s initial idea was to protect the module—the heart of a wristwatch—by surrounding it with some rubberized buffer material. He tested the shock resistance of over two hundred prototypes by dropping them on the floor from a height of about ten meters, which resulted in one failure after another. By the time a prototype passed this test, the buffer material encasing the module was as big as an apple, which would naturally be impossible to sell. Feeling stuck, Ibe found inspiration when he happened to see a little girl playing in a park. “She was bouncing a ball on the ground, and Ibe had a vision of the wrist watch module in the core of the ball,” Yanagihara explains. “This led to the invention of a wristwatch with a hollow structure, in which bearings inside the body of the watch support a floating module. He also came up with the omnidirectional covering that prevents vulnerable parts of a wristwatch—such as buttons and the LCD screen—from hitting the ground when dropped. 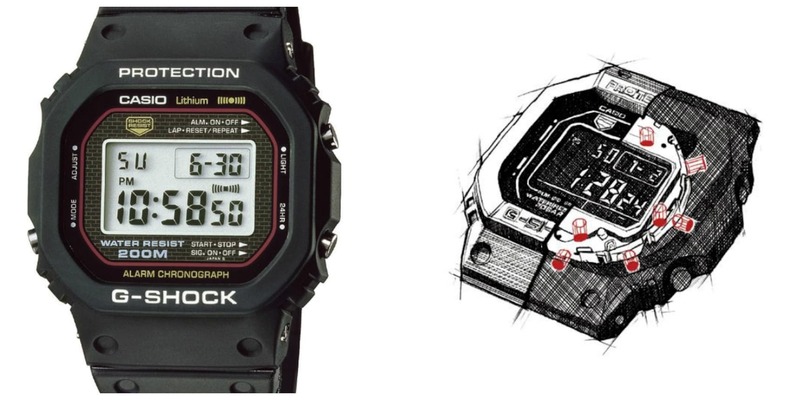 These two features are included in all G-SHOCK products and are at the heart of the brand’s concept of ‘absolute toughness." After two years of product development, the G-SHOCK debuted simultaneously in Japan, the United States and Europe in 1983. A TV commercial produced in 1984 in which an ice hockey player shoots a G-SHOCK instead of a puck and the wristwatch remains whole sparked the brand’s worldwide popularity. The commercial was criticized as being all hype, but an American TV program later tested it and proved the product’s extraordinary shock tolerance. Since then, outdoor enthusiasts, firefighters, police officers, U.S. armed forces personnel and other people who need highly durable wristwatches have bought the G-SHOCK. “In the 1990s, the G-SHOCK’s sturdiness and style also caught the eye of skateboarders on the West Coast of the United States, which then brought it to the attention of young people in Japan in a form of reverse import, leading to domestic popularity,” says Yanagihara. Since then, Casio has expanded to over a thousand authorized distributors and collaborated with international athletes, musicians and fashionistas, as well as automobile producers, fire departments and other groups. In addition to Europe, the United States and Japan, the brand is also wildly popular in Asia, which helped the G-SHOCK series achieve a cumulative global shipment of a hundred million units as of September 2017. While remaining loyal to their core concept of absolute toughness, the G-SHOCK has also evolved to include elaborate functions, including radio wave solar power, GPS radio wave reception, weather forecasts, and time synchronization through smartphone interlocking. “Every time we attempt to incorporate an innovative new technology or material, we add new criteria to the overall product testing process to ensure shock resistance and other qualities are maintained. We now have over two hundred testing criteria,” Yanagihara notes. This beloved wristwatch will keep evolving in the pursuit of absolute toughness and accuracy.